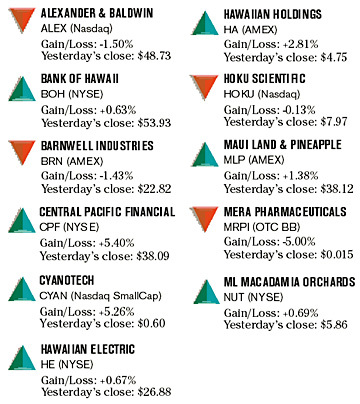 Central Pacific Financial Corp. was the top performer in the Bloomberg Honolulu Star-Bulletin stock index this week with a gain of 5.4 percent, closing at $38.09. 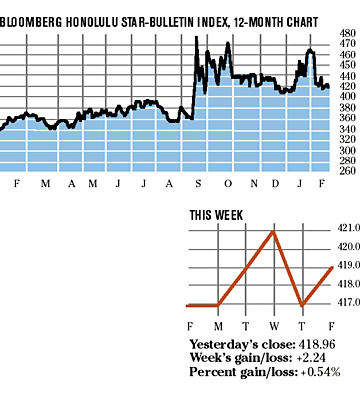 The parent company of Central Pacific Bank is up more than 6 percent so far this year, third-best in the index, but has a gain of only 3.55 percent for the last 12 months. The biggest loser in the index this week was penny stock Mera Pharmaceuticals Inc., down 5 percent to close at 1.5 cents. Mera is down more than 6 percent year to date, but is flat for the last 12 months.